What Day Of The Week Was June 3, 1932? 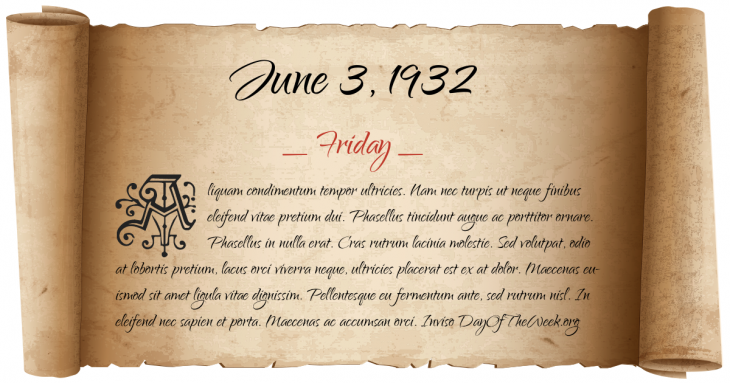 June 3, 1932 was the 155th day of the year 1932 in the Gregorian calendar. There were 211 days remaining until the end of the year. The day of the week was Friday. A person born on this day will be 86 years old today. If that same person saved a dollar every day starting at age 3, then by now that person has accumulated $30,636.00 today. Here’s the June 1932 calendar. You can also browse the full year monthly 1932 calendar. Lou Gehrig and teammate Tony Lazzeri hit four home runs in one game, and hit for the natural cycle, respectively. These two feats are both less common than a perfect game, which has occurred twenty one times in one hundred and twenty years.